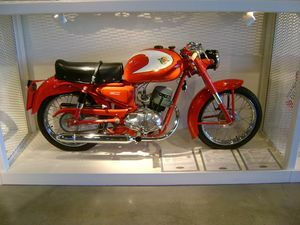 Derived from the 98cc model, this Ducati 125 was unique in that it carried the lubricating oil in the main frame tubes, circulated by a special double oil pump. By this time the overhead cam models were in production but were priced a lot higher than the push-rod economy models. This page was last edited on 20 August 2010, at 18:39.